I love love LOVE where we live. We live on a cul-de-sac that is attached to another cul-de-sac, which means almost zero traffic. The kids have such a great time playing outside. Halloween is the ONLY night I don't like the lack of traffic. We had a LOT of left over candy last year. So this year I am planning to do something fun for just the neighborhood kids, since they are the only ones who come trick or treating at our house. While I was looking for ideas, I stumbled across this fun Halloween play dough that Amy made a couple of years ago. Most of the kids are a little too old for play dough, but if you are having a Halloween party, this would be a fun party favor! 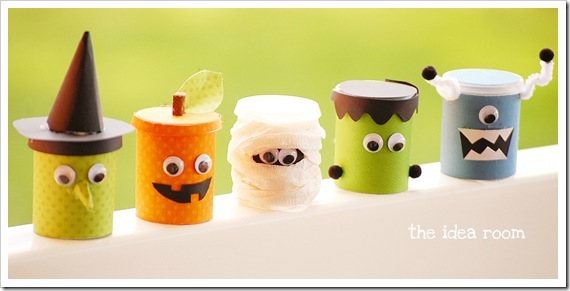 You can check out how to make homemade play dough and how to decorate Halloween play dough jars over at The Idea Room.